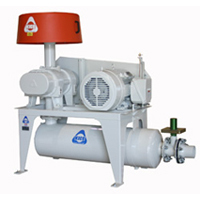 Kice air power units are suited for a wide range of applications such as positive and negative pressure conveying systems, fluidization systems, vacuum sweeper systems, filter systems and many other unique applications. Our engineers have four generations of experience in properly applying air power units. Kice QuikShip is a dedicated parts and service team located in Wichita at the main office. An extensive inventory of parts is kept on hand for same day shipment. Kice QuikShip can be reached toll free at 877-289-5423. Building strong air power units is only half the battle. Blower size, motor size, speed, pressure relief settings, temperature, elevation and many other factors affect the performance on an air power unit. Many companies build blower packages, but only Kice has the experience and technical ability to also apply them properly. When a customer calls Kice with an application, a Kice process engineer will quickly and accurately determine the critical factors; then provide the customer with a package that perfectly satisfies their requirements. 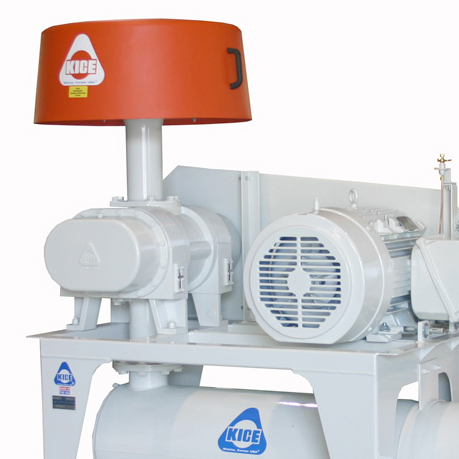 Kice air power units are delivered completely assembled and ready to operate. Sanitary welded frames are heavy duty, jig welded frames that provide rigidity and strength. 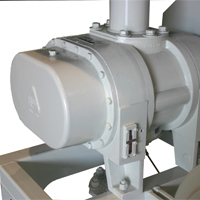 Units come with quality, TEFC motors as standard equipment. With design flexibility and a wide range of motors, Kice air power units can be custom-tailored to match your specific needs. 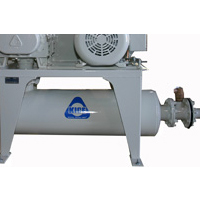 Kice PD blowers are standard equipment and provide peak performance, but we will incorporate any brand of positive displacement blower at your request. 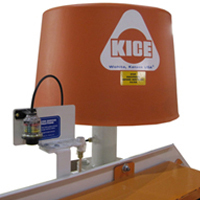 Kice IFS inlet filter/silencers provide filtered air to the blower while helping to reduce noise. Outlet silencers such as the Silenzair muffler are installed to further enhance attenuation. They feature a straight-through design to reduce back-pressure and save valuable energy. Either “packed” or “chambered” designs are available. Pressure relief valves are used to protect both the blower and motor. The number of weights determine the relief pressure. Check plate assemblies on the air outlets protect the blower from reverse airflow and subsequent damage in the event of unexpected equipment shutdown. The flapper pivots on a high-strength and wear-resistant stainless steel shaft. A positive seal against reverse airflow is enhanced by a replaceable Teflon® seal. Filter Minder Gauge is now standard on all Kice Air Power Units is a Filter Minder gauge. This unit allows the operator to know how dirty or clean their inlet filter is. An indicator also tells the operator when it is time to replace, or clean the inlet filter. Pressure gauges are quality, liquid-filled pressure gauges and provide “at a glance” monitoring of operating pressure, 0 to 30 PSI. Kice guards are jig welded, strong and have open mesh faces for visual inspection.It features a rust-proof housing and cleanable/reusable open-cell polyurethane filter media. 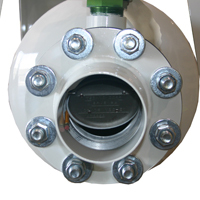 Pressure switches and transmitters can be provided for use with plant controls. These units are typically specified by a Kice Automation specialist. Stacked units are available for installations with limited space availability. 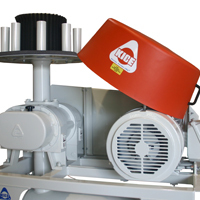 Kice Air Power Units can utilize any blower manufacturer you require.